Editor’s note: This is part one of a four part series of op-eds that examine and explore the state of black America. The history of African enslavement and freedom in America is both engaging and fraught with confusion, half-truths and unsubstantiated facts, making it both hard to understand and explain. But it’s important that we make the effort if we’re to comprehend the current state of black America and its future. 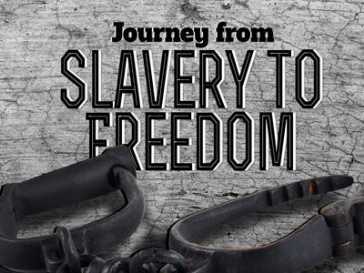 Slavery as an institution goes back to ancient times, but African enslavement in this country is generally said to have begun in 1619, when the first 20 captured Africans arrived in Jamestown, Va., to work on the tobacco plantations. This “peculiar institution” — as southern whites referred to slavery — would continue to grow over the next two and a half centuries, eventually ensnaring millions of people in complete servitude that often extended from the womb to the grave. By the end of the Civil War in 1865, there were nearly 4 million enslaved men, women and children living in states throughout the South. And though slavery officially ended in the U.S. at the end of that year with the ratification of the 13th Amendment (an ending that had begun two years earlier under the Emancipation Proclamation), black people were far from free. From the establishment of the sharecropping system to the “separate but equal” Jim Crow laws, black Americans were subjected to a different set of rules. For some, this may seem like ancient history, but it is not, as this separationist doctrine remained legally in effect up until 1954 with the Brown v. Board of Education decision — and practically in effect for much longer. In 1969, for example, the U.S. Department of Education found Maryland to be one of 10 states still operating a “racially segregated system of [higher] education.” Roughly 250 years of enslavement and decades more of legalized segregation in this country made the ideas of freedom and equality for black people difficult concepts for some white Americans, many of whom fervently wrestled with and fought against them. The desire to be free, to be equal, and to be unrestricted in movement and opportunity has always existed in the hearts and minds of black people. In fact, one of the earliest documented slave rebellions happened in 1687 on a Virginia plantation. And the first documented court case that legally challenged segregated schools (a prelude to Brown v. Board) was filed in 1849 and argued that legalized segregation psychologically damaged black students. There were always, in a sense, two movements happening: One took place in the courtrooms, trying to change policies, practices and laws; and the other took place in the streets, trying to change the hearts and minds of America’s citizens. A targeted system of laws and customs reinforced racial segregation and discrimination in public schools, parks, theaters and lunch counters for years, restricting the economic, educational and social progress of black Americans. Yet, within this environment of institutionalized and legalized racism, black people continued to build churches, establish colleges and schools, organize legal campaigns and establish and operate national businesses. It was an ongoing movement of survival and empowerment by black people who chose, every single day, to survive. From 1954 up until 1972, the country was preoccupied with the modern civil rights movement, which was an organized struggle to force states to uniformly apply the law. During this time black people were not simply fighting for freedom, they were fighting for equality — understanding that their worth and ability to live free and actualized lives were intricately bound to their legal and social status. While lawyers were fighting de jure segregation, activists were on the ground fighting de facto segregation by marching in the streets, writing manifestoes, staging “pray-ins” and getting arrested. Today, black people have more opportunities than ever before thanks to the unrelenting commitment and courageous activism of our nation’s citizens. Yet America is still not the country of equality that it should be, as deep-rooted feelings of racism and social inequality still linger. The ongoing #BlackLivesMatter movement concerning relations with police has made this painfully obvious, along with rising illiteracy rates and unemployment numbers within the black community and the increased backlash against affirmative action policies. Our American story is still evolving, and the past is a part of it. We must begin to own, claim and examine it so that we can transcend it. Karsonya Wise Whitehead is an assistant professor at Loyola University Maryland and the author of the new book, “Letters to My Black Sons: Raising Boys in a Post-Racial America.” She can be reached at kewhitehead@loyola.edu. Conra Gist is an assistant professor at the University of Arkansas.